Lechuguilla Cave in New Mexico, United States. A cave is a natural underground void large enough for a human to enter. Some have suggested that the term 'cave' should be reserved for cavities that have some part that does not receive daylight. In popular usage, however, the term includes smaller spaces like sea caves, rock shelters, and grottos. The scientific study of caves is known as speleology. Caves are valuable sites for biological, geological, and archaeological studies. Biologists have found unusual species that inhabit caves, some of which are not found outside of caves. Geologists who study caves have discovered subterranean processes and details of past climatic conditions. Archaeologists have been able to learn about primitive peoples who used caves for shelter, burial, and religious rituals. Today, caves are often used for recreation and for the preservation or aging of wine and cheese. Exploring a cave for recreation or science may be called "caving," "potholing," or (in the United States) "spelunking." Caves are found throughout the world, but only a portion of them have been explored and documented by cavers. The distribution of documented cave systems is skewed toward countries where caving has been popular for many years, such as France, Italy, Australia, the UK, and the United States. 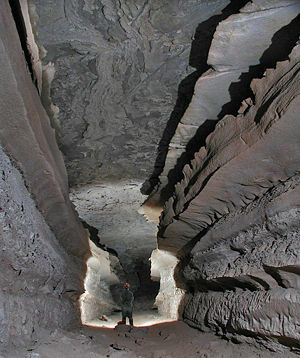 As a result, explored caves are found widely in Europe, Asia, North America, and Oceania but are sparse in South America, Africa, and Antarctica. That statement, however, is a broad generalization, as large expanses of North America and Asia contain no documented caves, whereas areas such as the Madagascar dry deciduous forests and parts of Brazil contain many documented caves. As cavers explore additional expanses of soluble bedrock around the world, the distribution of documented caves is likely to shift. For example, although China has about half the world's exposed limestone (more than 1,000,000 square kilometers (km²)), it has relatively few documented caves. Canyon passage in Mammoth Cave, the world's longest cave. Caves are formed by geologic processes, which may involve a combination of chemical processes, erosion from water, tectonic forces, microorganisms, pressure, and atmospheric conditions. Most caves are formed by the dissolution of limestone. Exploring a lava tube in Hawaii. Solutional caves may form in places where the rock is soluble. They are most prevalent in limestone but can also form in other material, including chalk, dolomite, marble, granite, salt, sandstone, fossilized coral, and gypsum. The most common process of cave formation is karstification, which is the dissolution of rocks by rainwater. The largest and most abundant solutional caves are located in limestone. Limestone dissolves under the action of rainwater and groundwater charged with H2CO3 (carbonic acid) and naturally occurring organic acids. The dissolution process produces a distinctive landform known as karst, characterized by sinkholes, sinking streams, and underground drainage. 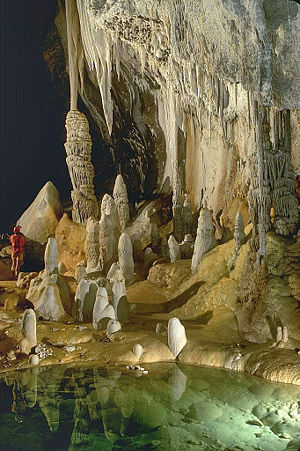 Limestone caves are often adorned with calcium carbonate formations produced through slow precipitation, including the most common and well-known stalactites and stalagmites. These secondary mineral deposits in caves are called speleothems. Lechuguilla Cave (New Mexico, USA) is generally regarded as the world's most spectacularly decorated cave. This cave and nearby Carlsbad Caverns are now believed to be examples of another type of solutional cave. They were formed by acid rising from below, rather than by acidic water percolating down from the surface. It is thought that reservoirs of oil gave off sulfurous fumes, which mixed with groundwater to form sulfuric acid (H2SO4) that then dissolved the limestone from below. Some caves are formed at the same time as the surrounding rock. These are called primary caves. The most common primary caves are lava tubes, which are formed through volcanic activity. As lava flows downhill, its surface cools and solidifies. Thereafter, the molten lava flows under this crust, until the eruption ends. If the liquid lava inside the crust flows out, a hollow tube remains. Numerous lava tubes are found on Hawaii (Big Island). Kazumura Cave near Hilo is the longest and deepest lava tube of the world and also the eighth-longest cave of the United States. It is 65.6 km long. Blister caves are also formed by volcanic activity. 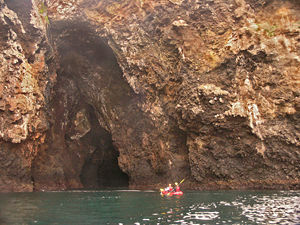 Painted Cave, one of the world's largest sea caves, Santa Cruz Island, California. Sea caves are found along coasts around the world. A special case is littoral caves, which are formed by wave action in zones of weakness in sea cliffs. Often these weaknesses are faults, but they may also be dykes or bedding-plane contacts. Some wave-cut caves are now above sea level because of later uplift. Elsewhere, in places like Thailand's Phang Nga Bay, solutional caves have been flooded by the sea and are now subject to littoral erosion. Sea caves are generally around 5–50 meters (m) in length but may exceed 300 m.
Glacier cave in Big Four Glacier, Big Four Mountain, Washington, ca. 1920. Fracture caves are formed when layers of more soluble minerals such as gypsum dissolve out from between layers of less soluble rock. These rocks fracture and collapse in blocks. Talus caves are the openings between rocks that have fallen down into a pile, often at the bases of cliffs. 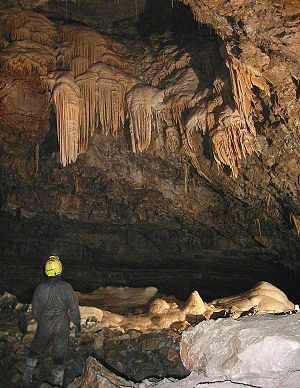 Speleothems in the Hall of the Mountain Kings, Ogof Craig a Ffynnon, South Wales. Anchihaline caves contain a mixture of freshwater and saline water (usually seawater). They are usually coastal and occur in many parts of the world. They often contain highly specialized and endemic fauna. The cave system with the greatest total passage length is Mammoth Cave (Kentucky, USA) at 579 km in length. This record is unlikely to be surpassed in the near future. The next most extensive known cave is Jewel Cave near Custer, South Dakota, at 225 km. As of 2005, the deepest known cave (measured from its highest entrance to its lowest point) is Voronya Cave (Abkhazia, Georgia), with a depth of 2,140 m. This was the first cave to be explored to a depth of more than two km. (The first cave to be descended below one km was the famous Gouffre Berger in France). The Gouffre Mirolda-Lucien Bouclier cave in France (1733 m) and the Lamprechtsofen Vogelschacht Weg Schacht in Austria (1632 m) are the current second and third deepest caves. This particular record has changed several times in recent years. The deepest individual pitch (vertical drop) within a cave is 603 m in the Vrtoglavica cave in Slovenia, followed by Patkov Gušt (553 m) in the Velebit mountain, Croatia. The largest individual cavern ever discovered is the Sarawak chamber, in the Gunung Mulu National Park (Sarawak, Borneo, Malaysia). It is a sloping, boulder-strewn chamber, with an area of approximately 600 m by 400 m and a height of 80 m.
Townsend's big-eared bats in a cave. Troglobites: species that limit their lives to caves. Troglophiles: species that can live their entire lives in caves, but also occur in other environments. Trogloxenes: species that use caves but cannot complete their life cycle wholly in caves. Accidentals: animals that are not in any of the above categories. Some authors use separate terminology for aquatic forms, such as stygobites, stygophiles, and stygoxenes. Of these animals, the troglobites are perhaps the most unusual organisms. Troglobitic species often show a number of characteristics, called troglomorphies, associated with their adaptation to subterranean life. These characteristics may include a loss of pigment (often resulting in a pale or white coloration), a loss of eyes or eyesight, an elongation of appendages, and an enhancement of other senses (such as the ability to sense vibrations in water). Aquatic troglobites (or stygobites), such as the endangered Alabama cave shrimp, live in bodies of water found in caves and get nutrients from detritus washed into their caves and from the faeces of bats and other cave inhabitants. Other aquatic troglobites include cave fish, the olm, and the blind salamander. Cave insects such as Oligaphorura (formerly Archaphorura) schoetti are troglophiles, reaching 1.7 mm in length. They are extensively distributed and have been widely studied. Most specimens are female but a male specimen was collected from St Cuthberts Swallet in 1969. 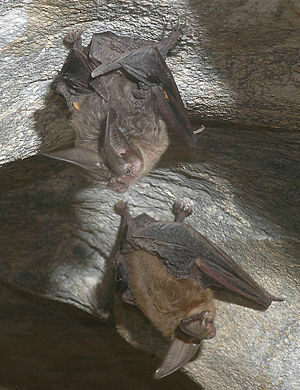 Bats, such as the gray bat and Mexican free-tailed bat, are trogloxenes and are often found in caves. They forage outside of caves. Some species of cave crickets are classified as trogloxenes because they roost in caves by day and forage above ground at night. Given the fragile nature of the cave ecosystem, and the fact that cave regions tend to be isolated from one another, caves harbor a number of endangered species, such as the tooth cave spider, Liphistiidae Liphistius trapdoor spider, and the gray bat. Caves are visited by many surface-living animals, as well as humans. Usually, these incursions are relatively short-lived, due to the lack of light and sustenance. 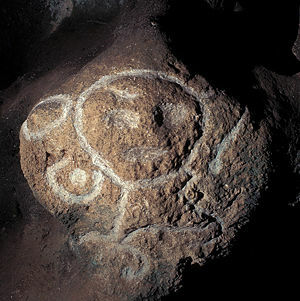 Taino petroglyphs in a cave in Puerto Rico. Throughout history, primitive peoples have made use of caves for shelter, burial, or as religious sites. Because items placed in caves are protected from the climate and scavenging animals, caves are an archaeological treasure house for learning about those peoples. Cave paintings are of particular interest. One example is the Great Cave of Niah, which contains evidence of human habitation dating back 40,000 years. In Germany, some experts found signs of cannibalism in the caves at the Hönne. Caves are also important for geological research because they can reveal details of past climatic conditions in speleothems and sedimentary rock layers. Caves are frequently used today as sites for recreation. 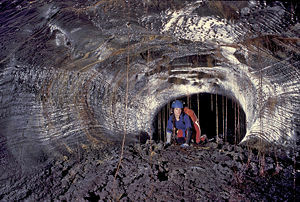 Caving, for example, is the popular sport of cave exploration. For the less adventurous, a number of the world's prettier and more accessible caves have been converted into show caves, where artificial lighting, floors, and other aids allow the casual visitor to experience the cave with minimal inconvenience. Caves have also been used for BASE jumping and cave diving. Caves are also used for the preservation or aging of wine and cheese. The constant, slightly chilly temperature and high humidity of most caves make them ideal for such purposes. ↑ James Shreeve, "The Greatest Journey," National Geographic March 2006. Classification of Caves A list of cave types with links to further information. 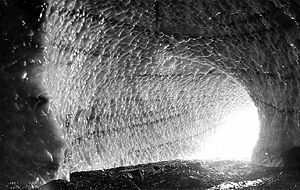 Speleological Abstract (SA/BBS) An annual review of the world's speleological literature. The Virtual Cave Photographs of many types of caves. This page was last modified on 19 January 2017, at 16:35.